Running a business is time consuming and often leaves little room for owners to keep up with the latest in marketing, legal issues, operations and more. That's why ABC recently launched the Small Business Answers center. Our team of small business experts can help you with some of your most pressing questions. 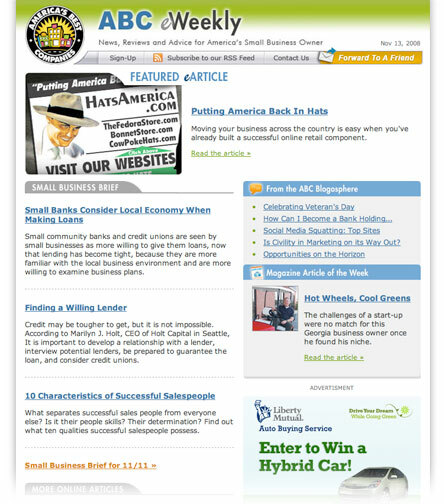 Simply go to the ABC Small Business Answers center and post your business-related questions. A response, in most cases, will be posted online in less than one business day. Find answers to questions like: What makes a successful marketing plan? What do I need to know about financial statements? And what are some easy search engine optimization tips for my business? Help us build the most complete and effective small business Q&A forum on the Web. As Vice President of America's Best Companies, Dave Cosper manages the daily requirements of the business, as well as corporate growth and development. He has over six years of experience working specifically with small businesses and is a frequent contributor to America's Best magazine covering topics like Internet marketing, advertising and technology. Email Dave. Need to Teach Employees How to Break Out of Jail? Are Your Sales Questions Holding You Back?